Dreambaby Safety Catches 12 Ct Just $2.78! Down From $6.48! You are here: Home / Great Deals / Amazon Deals / Dreambaby Safety Catches 12 Ct Just $2.78! Down From $6.48! We are prepping for a new grandbaby in December so, this is one deal we will definitely be snagging! You can get these Safety Catches right now down from $6.48 to just $2.78! What is a Safety Catch? Dreambaby Safety Catches are strong, easy to install, durable locks. 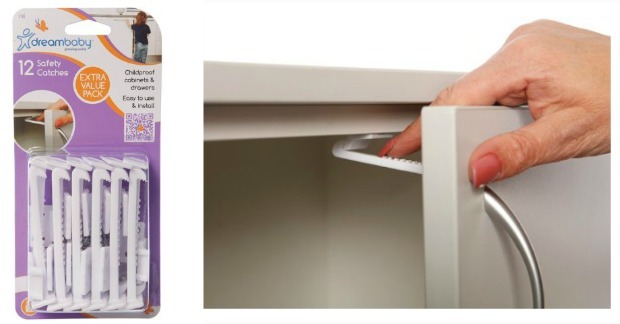 They provide quick access for adults while making it almost impossible for children to get into cupboards and drawers that may contain harmful objects. They are suitable for use on the top or side of most cabinets. Safety Catches are also suitable for use on top drawers. They may be used on lower drawers where there is a top divider to which the catch may be fitted.